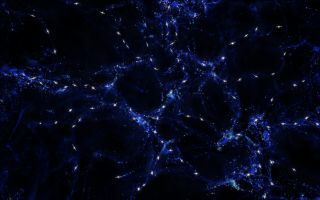 This stunning space wallpaper is an artist's impression showing schematically the mysterious alignments between the spin axes of quasars and the large-scale structures that they inhabit that observations with ESO’s Very Large Telescope have revealed. This stunning space wallpaper is an artist's impression showing schematically the mysterious alignments between the spin axes of quasars and the large-scale structures that they inhabit that observations with ESO’s Very Large Telescope have revealed. These alignments are over billions of light-years and are the largest known in the Universe.